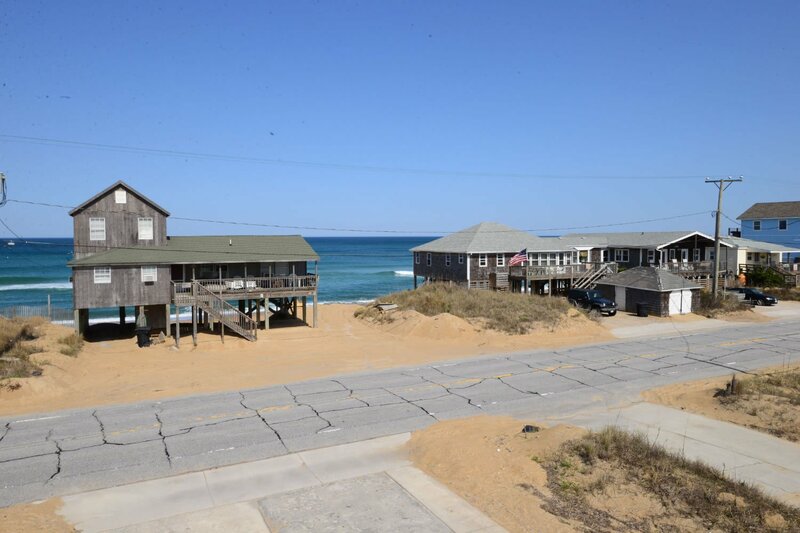 This Great Kitty Hawk Beach Cottage offers lots of deck space & has Wonderful Ocean Views. A Delightful Place to Vacation, this cozy home has everything your family will need while visiting the Outer Banks. It's Crisp, Cool Caribbean Inspired Decor will Sooth Away Your Worries. Relax on the Deck while enjoying the views of the ocean or take a walk on the Beach, it's approximately 260 ft. to beach access at Maynard Street. Ground Level: Parking for 4 Cars, Storage, Steps to Mid Level Entry, Enclosed Outside Shower, Private Swimming Pool, Charcoal Grill, & Picnic Table. Mid Level: 4 Bedrooms (1 Master Suite w/Queen, TV, & Full Bath, 1 w/Queen, & TV, 1 w/Duo Bunk, & TV, Shared Full Bath & 1 w/2 Singles & TV), Full Hall Bath, Laundry Area, Ocean-facing Covered Deck w/Porch Swing, & West-Side Covered Deck w/Hot Tub. Top Level: Living/Dining/Kitchen Area w/TV, DVD, & Great Ocean Views, Half Bath, Master Suite w/Queen, TV, & Full Bath, Oceanfacing Covered w/Deck Furniture, & West-side Covered Deck w/Deck Furniture. Features Include: C/AC & Heat, Washer/Dryer, Dishwasher, Microwave, Phone, 6 TVs, DVDs, VCR, Wireless Internet, Stereo w/CD, & 3 Ceiling Fans. Two Mature Dogs Allowed w/Fees. This is a Non-Smoking Unit. The house met all of our needs and we really enjoyed our stay. The pots/pans/cookware could use updating. We enjoyed our stay. The house met our needs. The bedrooms were comfortable. The color choices were lovely and loved the quilts on the beds. The location was great. The kids loved the pool! Couldn't ask for a better house for pets, although don't get excited about having the in the pool with you (understandably NOT Allowed). Kitchen cookware selection is limited. If you want pancakes, bring your own griddle or be ready to cook one at a time. No complaints though, nobody goes to the OBX expecting a gourmet kitchen, making do with what you find is half the fun. We loved Sea Glass!!! Cannot beat the view from upper porch! Love the colors of the house, and the closeness to the beach! Great location for walking to the beach and the pool is a very nice addition for relaxing after dinner!! We enjoyed 3 weeks at Sea Glass in May 2015. Loved the cottage decoration, very comfortable. Location has excellent views and you can hear the ocean all the time. Loved the pool and hot tub. This is not a small house. Has roomy bedrooms and bathrooms. Nice open kitchen, dining and living room with ocean views. Porch great for sitting and reading or just watching the waves. Loved having Master bedroom on top floor and other 4 bedrooms on lower floor. Gave everyone privacy and quiet time. Well located to stores. The best seafood place is in front of the Walmart, across from Food Lion. Fresh, Friendly and busy!!! Hated to leave!!!! Great location, nice view of the ocean. Loved the location ... great beach view and so nice just to cross the street to get to beach. Loved the house ..we all said we had the best house on the block but we could have used a crock pot, a little better pan selection and sharper knives. Great place to stay - great amenities and great ocean views. We have stayed here in the past and will stay here again.